It's SRC time again! Each month, as part of the Secret Recipe Club, we're assigned another blogger. We get to select a recipe from their blog to recreate. This month, I got Micha from Cookin' Mimi. You might remember her from Share Your Stuff Tuesday or Inspire Me Monday. Looking through her blog, I found lots of Southern cooking. The type of stuff I'm sure James wouldn't mind me cooking more of and the types of food I feel I should be more familiar with. I debated between Southern staples like sauteed kale and even further Southern food, like taco potato wedges and corn salsa. Then, I decided to make Jalapeno Bacon Corn. Except I didn't have any fresh jalapenos. I did, however, have some chipotles, which are just smoked jalapenos, so I went with it. 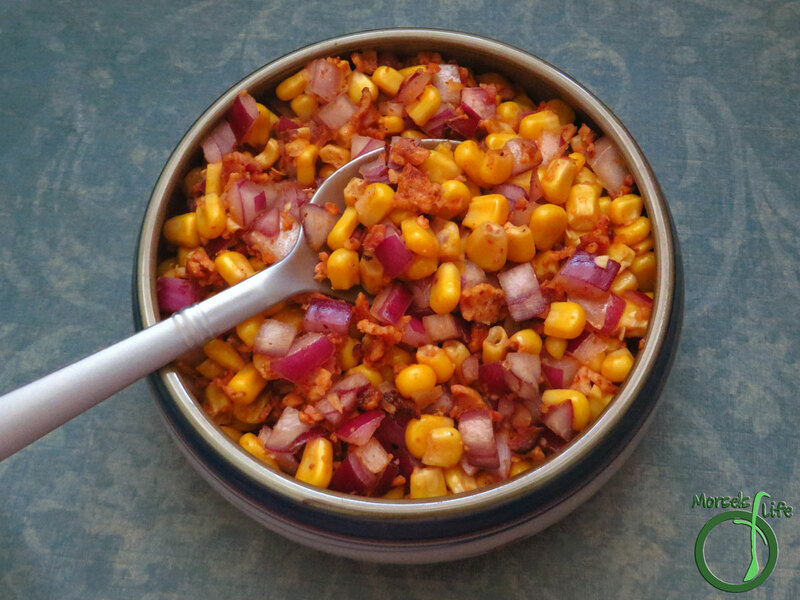 And with all the heat and humidity around here, I thought I'd make a chipotle bacon corn salad. Keep the yumminess, skip the cooking! 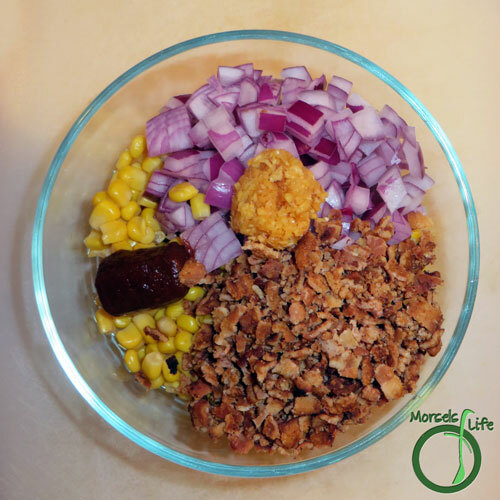 Serve this as a side, or like I did - as a salad topping! This stuff really packs in a big hit of flavor, and we enjoyed it. Do you prefer the flavor of regular jalapenos or the smoky chipotles? 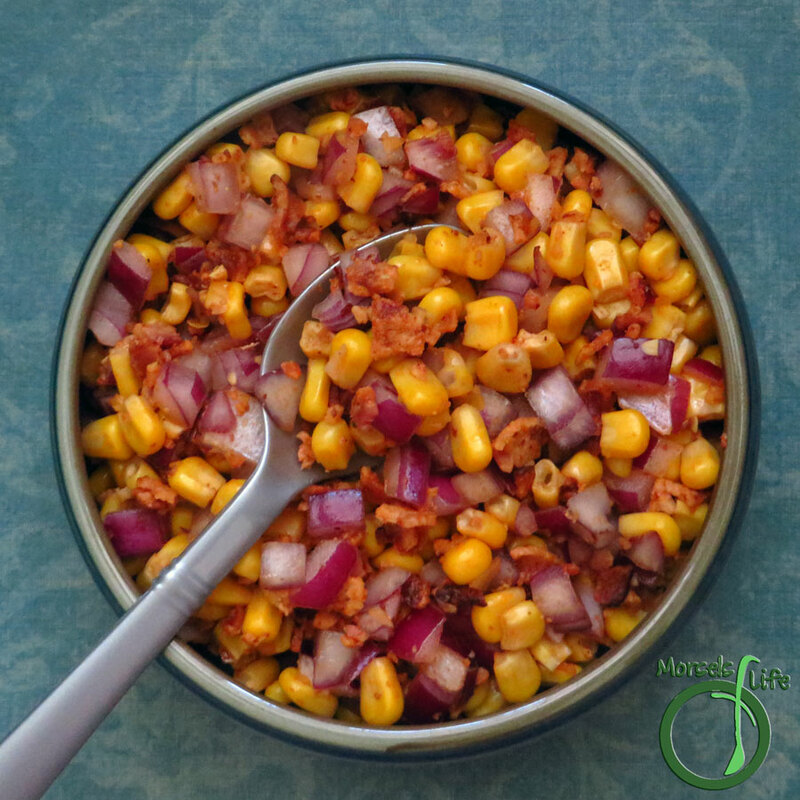 Smoky and spicy chipotle combined with sweet corn and savory bacon with garlic and red onion for extra yumminess. 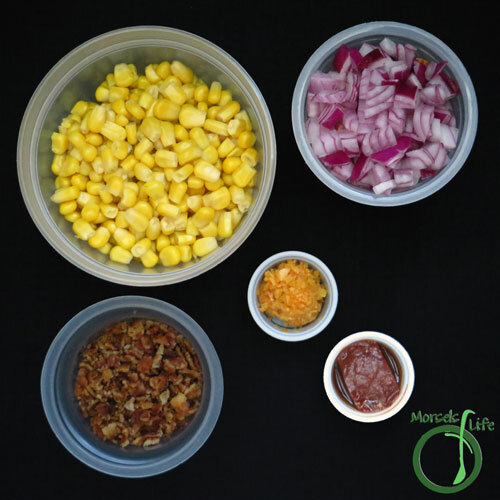 Serve as a side, snack, or even a salad topping! 2. Combine all materials and mix! This sounds delicious but I imagine it packs quite a punch with the chipotle..... Great selection. Oh yum. I've been on a chipotle kick lately and this looks amazing. You can never go wrong with spice and bacon! I need to make this soon! Oooh! That looks amazing! I like both chipotles and jalapenos, it just depends on my mood and what they are going in. I can see either being great in something like this! We are pretty equal opportunity about our peppers here. I have some jalapenos growing in my patio garden I can't wait to use fresh, but I think the substitution of chipotle peppers would add a wonderful smoky sweetness to the bacon and corn. Great choice for SRC! Sounds simple, seasonal, and delicious. So simple and so yummy looking! The chipotles sound like they would put a real kick in this dish. Now that's our kind of food! Oh yummy! 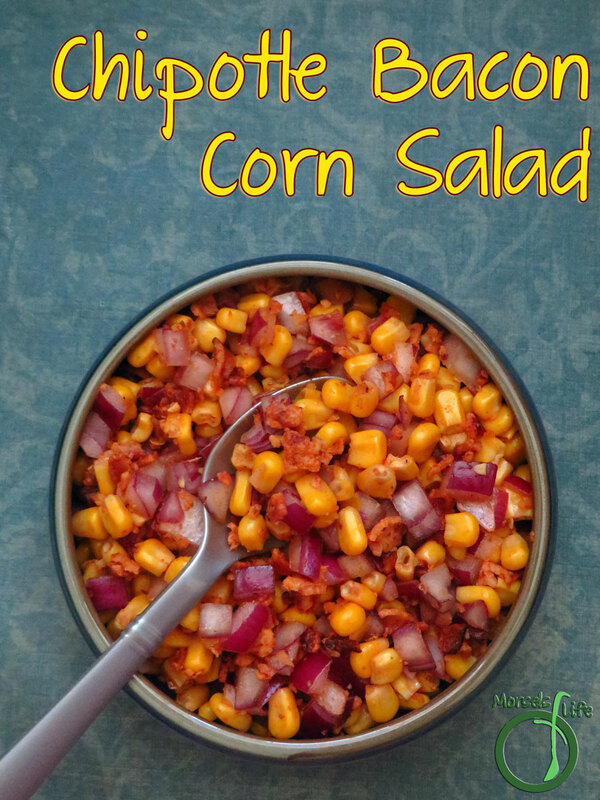 Perfect for the delicious summer sweet corn out right now! Oooh.. I love all things chipotle. I have a picnic to attend in a few weeks and I think this will be one of the dishes I make for it. Great pick! I'm happy to be new the SRC this month - I'd love it if you'd stop by and check out my post. Oh my gosh - I love your recipe set up with the materials list! So scientific! Love easy recipes like this! I can't take the heat, but I know my boyfriend will love it. I'm a fan of easy recipes too - life's too short to make complicated recipes all the time! :P You could decrease (or eliminate) the chipotle to decrease the heat. Maybe use bell peppers instead. :) Hope you and your boyfriend can both enjoy! This looks really good. I would probably have to turn the heat down a little, but I like all the combos of flavor. Thanks for sharing on Merry Monday.